The ongoing state government backed “land grab” action in the guise of saving the community narrative via a forced eviction of the water front residents of Otodo Gbame community in the Ikate-Elegushi area of Lagos state, albeit in outright defiance of a restraining court order, will not be shocking or surprising if you are a Nigerian or live in Nigeria. As often as history repeats itself, we never learn in this part of the world. And this is largely why the more things appear to change the more they remain the same (loose French translation). The might is always right in Nigeria and the worst crime a citizen can commit in Nigeria is to be poor, and be without any ties to power. As it was with residents of Maroko in the 1990 forced eviction, which gave birth to the now lucrative multiple Lekki/Oniru housing estates, so it has become with the residents of Otodo Gbame recently. 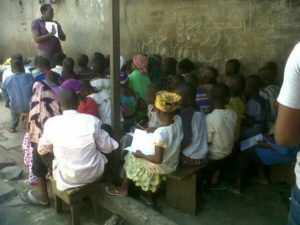 Back then, in the wake of the Maroko eviction, I remember some of our classmates (residing in Maroko) were not able to continue with school at 1,004 Estate Primary School due to the dislocation of their families. This was the little I knew because as a child all I missed then was not having my friends in class and to play with during lunch break and after school. Life was so simple being a child and after a while I played with new friends. I moved on, just as the adults not affected with the Maroko eviction did. Almost three (3) decades later, a community of traders, artisans and people who live in a slum neglected for years by the democratic government, most might have voted for at successive polls is faced with another Maroko-esque eviction (and not forgetting this despicable manner of land grab going on in other parts of the country). The dehumanisation of ordinary citizens is frequently politicised and despite a court’s restraining order, mass appeals via social media platforms and general campaigns for support and awareness (especially by JEI), the Lagos state government still went about this business of eviction with rash and brutal force on its own citizens; no let’s forget that, I meant to say on HUMAN BEINGS. Why does governance in Nigeria oppress rather than serve the people? Around 1990 -91, the residents of another water front estate sandwiched between Obalende and Osbourne (Ikoyi) were caught in a similar situation. They were notified by the LSDPC that the Jakande Housing Estate (a name synonymous with low/medium-cost public housing within and around Lagos state) in Ijeh was to be demolished and residents relocated to another low-cost housing estate elsewhere in the state. This was to enable the building of more high-end duplex units on a profitable Osbourne site to displace the existing low-cost housing units. The residents became agitated and disoriented as majority bought flats in this estate not only for its affordability but more for its location (close to Ikoyi, Victoria Island, Lagos Island and bridge access to the mainland) i.e. proximity to their respective workplace, businesses, children’s schools and other livelihood pursuits. It is important to mention that no other Lagos State Government, civilian or military, has provided actual affordable housing (owner occupier models) for the working class other than Alhaji Lateef Jakande’s government (1979 – 83). His government built low-cost housing to cater for the low-income earners in the state. And after his tenure, his housing project gave rise to Abesan, Amuwo Odofin, Iba, Ijaye, Ijeh & Adeniji Adele (now Dolphin Estate Housing Schemes), Iponri, Isolo, Oke-Afa and Ojokoro estates. The residents in Civil Service and those in private businesses who had access to one or more people in power back then held several meetings and petitioned LSDPC and the state government to a fruitful resolution. It was said that a powerful state official (in the governor’s office) who had family resident in the estate equally weighed in on the matter. Arguably the pressure and top citizens’ influences came to bear and instead of relocation an agreement was reached that a new 4-storey block of flats (Jakande estates are usually 3-storey blocks) will be built on parts of the same land, and the other part saw the expansion of the lucrative Dolphin estate duplex units. In addition, residents of the low-cost housing estate were made to pay an additional sum as part of the agreement towards the construction of the new blocks of flats. So, there was neither a relocation nor a forcefully eviction. Thank God for social influence and the actions of ‘friends in high places’. According to a Premium Times report, the Lagos State House of Assembly stated that the Ikate land belongs to the Elegushi family and declared the residents of Otodo-Gbame community as fishermen squatters. This has been the position of the state government as well as it directed all land owners along the coastal areas of the state to take ownership of their land. Different from the situation of Ijeh estate residents regarded as legitimate owners then, the Otodo-Gbame community residents have been called squatters – illegitimate occupiers. Let’s take it that they are squatters. For those of us who know Lagos and the brazen way land and residential houses are touted for sale and/or rent collection through both official and unofficial channels, these “squatters” on this water front land do pay rent to someone. No? While the legitimacy of the land owner is another issue, couldn’t the eviction process have been more humane and conscientious given the number of lives involved, the many children and vulnerable people who will be at risk of displacement and of any display of government might and belligerent action? The assault on property and maiming of people who expected the state government to respect the court’s restraining order, ironically a judicial arm of the same government, was callous and needless. One law for the people and another for the government and her agents! What would it cost to have a planned process of eviction where a relocation site is arranged or negotiated like civilised people that we are? Shouldn’t government be seen to help her citizens in emergency and helpless dispositions to safely relocate and rebuild in the least? We need to continuously call our government and public office holders to order on treatment of citizens and respect for the rule of law. What is the use of a government that only enacts laws but sees itself above the same law? As citizens, we need to be steadfast against injustice and oppression of fellow citizens. We can’t all have ‘friends in high places’ but we can all have humanity in us. And this will help us reach out for one another, speak up for one another and ultimately empower our voices as one against gentrification of our neighbourhoods for the elite and displacement of our families by Janus-faced leaders. We all contribute to the prosperity of Lagos, allow all of us benefit too. Special thanks to @justempower for providing all the pictures used in this post.